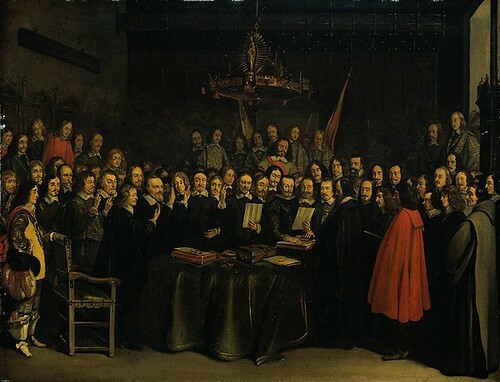 The Westphalia area of north-western Germany gave its name to the treaty that ended the Thirty Years’ War, one of the most destructive conflicts in the history of Europe. The war or series of connected wars began in 1618, when the Austrian Habsburgs tried to impose Roman Catholicism on their Protestant subjects in Bohemia. It pitted Protestant against Catholic, the Holy Roman Empire against France, the German princes and princelings against the emperor and each other, and France against the Habsburgs of Spain. The Swedes, the Danes, the Poles, the Russians, the Dutch and the Swiss were all dragged in or dived in. Commercial interests and rivalries played a part, as did religion and power politics. Among famous commanders involved were Marshal Turenne and the Prince de Condé for France, Wallenstein for the Empire and Tilly for the Catholic League, and there was an able Bavarian general curiously named Franz von Mercy. Others to play a part ranged from the Winter King of Bohemia to the emperors Ferdinand II and Ferdinand III, Bethlen Gabor of Transylvania, Christian IV of Denmark, Gustavus II Adolphus and Queen Christina of Sweden, the Great Elector of Brandenburg, Philip IV of Spain and his brother the Cardinal-Infante, Louis XIII of France, Cardinals Richelieu and Mazarin and several popes. Gustavus Adolphus was shot in the head and killed at the battle of Lutzen in 1632. The increasingly crazed Wallenstein, who grew so sensitive to noise that he had all the dogs, cats and cockerels killed in every town he came to, was murdered by an English captain in 1634. Still the fighting went on. A R-16 ballistic missile explodes on the launch pad at the USSR’s Baikonur Cosmodrome space facility. 100 people are killed. The Treaty of Brétigny is ratified at Calais, ending the first phase of the Hundred Years’ War. The police arrest John Allen Muhammad and Lee Boyd Malvo, putting an end to the Beltway sniper attacks in the area around Washington, DC.